JJ Hanrahan says he is loving being part of the ‘unbelievable squad’ at Saints. The Irish utility back arrived at Franklin’s Gardens from Munster this summer and will compete with Stephen Myler and Sam Olver for the No.10 shirt. 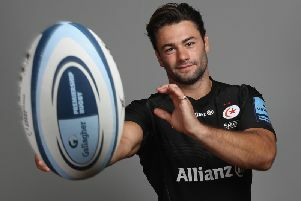 He registered a conversion and a penalty in the 36-17 pre-season win at Saracens last weekend, which was a game that showcased Saints’ strength in depth. And Hanrahan is enjoying being surrounded by so much quality. “I’m loving it” said the 22-year-old. “I’ve been here training for a few months now and it’s been great so far. “It’s all going really well and it’s been really easy to fit in. “The boys and coaches have been great so it’s been good. “It’s an unbelievable squad. There’s world class talent in the backline and the forwards. “I’m really looking forward to playing competitive games behind a really physical, aggressive pack and with a great backline outside me.